An excellent tool for streaming and downloading music and podcasts from radio stations and video portals, though it's sadly let down by an unappealing design that tries to show too many options at once using a confusing mix of interface elements. Audials One is an appealing proposition: a single, affordably priced program for streaming and recording audio from online radio stations – just like the good old days of audio cassettes, if you're old enough to remember those, but without the need to rewind the tape with a ballpoint pen. Audials doesn't just cover music, but podcasts and other broadcasts too. It has thousands of station in its database, so if a DJ somewhere has it, so do you. First, a note on legality. It's OK to record from radio stations for personal use in most countries, though it's a good idea to check the law in your area before using Audials One. Within the EU, for example, artists must be given 'fair compensation' for music recorded from radio stations. It could be argued that such recording is to be expected, and the compensation comes from the stations that pay to broadcast the music. There are no hard and fast rules yet, but things are likely to become clearer once software like Audials becomes more commonplace. It's also possible to save video from 'portals' such as YouTube with Audials One, though this is a little different to recording from a radio station. When recording music from video sites, you'll be presented with a warning to verify that the site allows this before proceeding. You can guess what the answer usually is. The nature of Audials One – hunting for specific tracks and artists in a vast sea of stations – means it lives and dies by the quality of its search, and thankfully it performs admirably. You can either download songs immediately via sites like YouTube and Vimeo, or add them to a wishlist so Audials records them as soon as they're played on a radio station (which results in better audio quality). You can wish for regular audio files, music videos or karaoke versions, and choose your own download settings (including speed and number of downloads to run in parallel). It's an excellent system – just set up your lists, click 'Activate' and leave Audials to do its thing. Because it's based around radio stations, Audials One is also a great way to discover new music by artists who would have otherwise slipped under your radar. Listen to a track by one of your favorite performers, then see what else the station has to offer. Searching for an artist or song will also provide a list of stations that play it regularly. 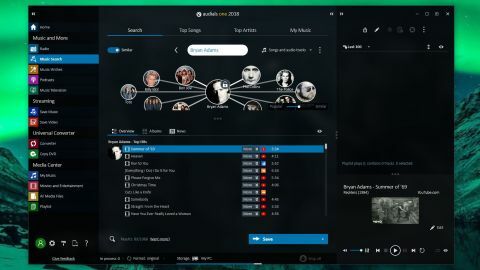 You can browse stations by genre and location, which is a welcome touch, and when you select an artist, other performers will appear in a mind-map style diagram. The principle makes sense, but unfortunately the graphics don't look great and don't scale well for different screen sizes. Sadly, this is symptomatic of Audials One's main drawback: an interface that's unintuitive and cluttered. Panels can be collapsed while you’re watching media, but the controls are esoteric and you’ll find yourself making heavy use of the tooltips that appear on mouseover. We can't help thinking a more minimal approach would be more accessible, with fewer menus and options visible at one time. Your saved files – audio and video – will appear in a playlist on the right. Here you can add tags, add the file to a custom playlist, burn it to a CD and even make a ringtone. All these disparate options are available in the right-click context menu. Audials One also packs a few bonus tools to help you get more from your recorded songs, podcasts and other media, and unlike the extras included with many media apps, none of these feel superfluous. There's a great file converter that deals with all the most common audio and video types without issue, including special audiobook formats, which is a feature you don't see often enough. There's also a DVD copier that saves videos to a media file so you can store backups on your hard drive. Audials One is designed around music, so you'll need a different tool for backing up data, but that's to be expected. All in all, Audials One has the potential to be great, but is really let down by an interface that serves as a barrier between you and the radio stations you want. Hopefully a future update will address that problem, because it's a great concept.